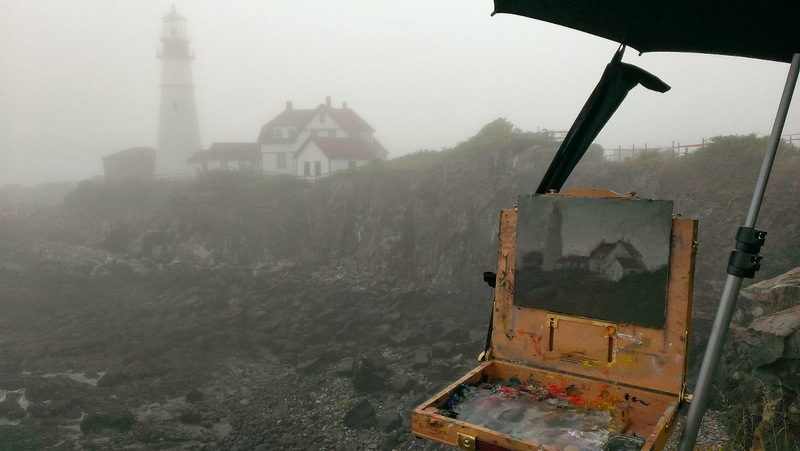 In Maine a plein air artist is translated as: one who stands in the fog and paints. Since moving to Maine, I have been painting in a fog... No, I mean that literally. I have spent many mornings driving to an area only to find it shrouded in fog. That is exactly what happened when I traveled to Portland and the famous Cape Elizabeth lighthouse. I say famous because there isn't a souvenir shop , diner menu or Maine calendar that doesn't carry an image of this light house. However, unlike most photographers and artists I ended up working in the rain. 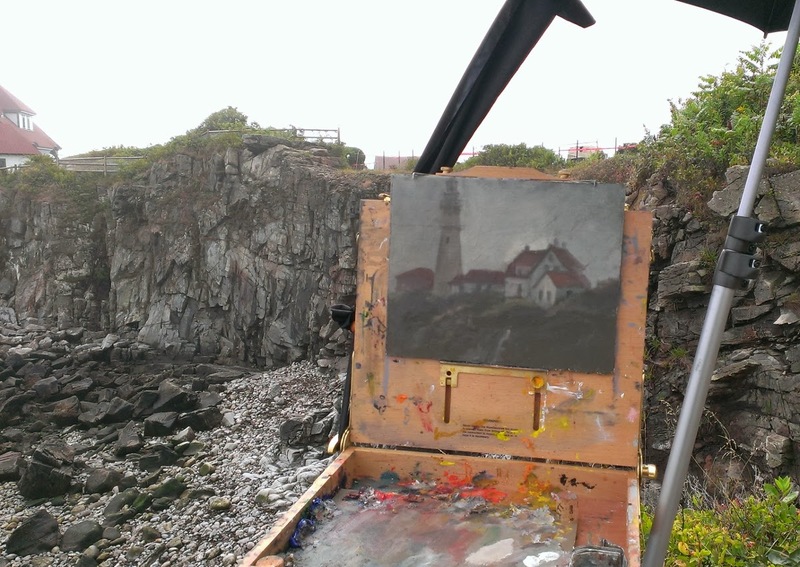 I used my plein air umbrella to protect the painting against the rain and held onto another for myself. Plein air painters often complain about the challenge of chasing the light outdoors. Well, you can't chase fog! It finds you and hides everything ... like your subject. But there are benefits to working in the fog. First, it helps you appreciate why someone would even think of building a lighthouse. The second benefit is it hides the fact that you are standing on a cliff with a fifty foot drop only inches away from your feet. There was no stepping back to check my progress on this painting. When the fog did lift a little I could see the cliff side much clearer. Still, painting a white lighthouse in the fog was an interesting challenge... but not losing any equipment over the cliff was even more interesting.